Remove moisture from freshly washed clothes with this 7.5 cu. ft. GE gas dryer. Its high-efficiency Sensor Dry system automatically senses moisture levels and shortens or extends drying time accordingly, and its Steam Refresh function rejuvenates lightly worn clothes by removing wrinkles and odours. This GE gas dryer has a stainless steel drum that maintains hot temperatures and resists rusting. Would you like in suite laundry but don't have the space, or the power supply? At just 31 x 23.5 x 21.5 inches (HxWxD) and 3.5 Cu. Ft., 110V ED 860V Compact Standard Dryer is a perfect fit for your home and your life. The sleek, stackable vented dryer boasts a variety of innovative features, all in a design just a fraction of the size of typical dryers. Families across North America love the ED 860V's ability to pause on command, protect against wrinkles, and provide child-lock protection. The dryer also features a 180 degree door swing, high-speed turbo fan, refresh function and overheating protection to make drying a breeze. The ED 860V comes equipped with 3 programmable levels of sensor drying to match your preferences. Its white premium finish with silver trim makes a modern statement, and it can be easily raised up to 2.25 inches to match your washer's height. Condensing dryer, does not vent Unless explicitly stated otherwise, all washers and dryers are sold individually, not as sets, and all accessories such as pedestals and stacking kits are sold separately. This ultra large capacity dryer can accommodate so much laundry, it may sometimes seem bottomless. Plus, LG's Intelligent Electronic Control Panel with LED Display and Dial-a-Cycle features intuitive controls that will give you the confidence to just "set it and go." Add to this a Sensor Dry System, which measures the moisture-level during the cycle and adjusts the drying time and you have a dryer that will make your life better. 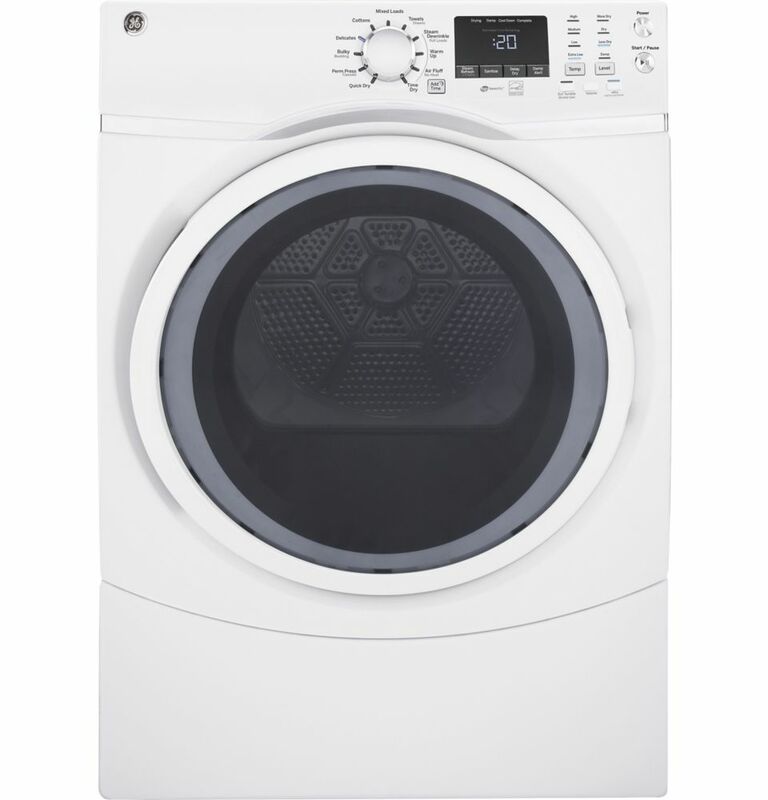 7.5 cu.ft capacity frontload gas dryer - white - ENERGY STAR® Remove moisture from freshly washed clothes with this 7.5 cu. ft. GE gas dryer. Its high-efficiency Sensor Dry system automatically senses moisture levels and shortens or extends drying time accordingly, and its Steam Refresh function rejuvenates lightly worn clothes by removing wrinkles and odours. This GE gas dryer has a stainless steel drum that maintains hot temperatures and resists rusting. 7.5 cu.ft capacity frontload gas dryer - white - ENERGY STAR® is rated 5.0 out of 5 by 1.